The Federal Reserve launched yet another interest-rate hike after its mid-March policy meeting – the sixth such increase since December 2016, and what the Fed anticipates will be the first of three this year. Predictably, a certain subset of the market shuddered in response: lazy, low-growth dividend stocks. But at the same time, shareholders of a few other stocks quietly celebrated what should be a win for the years ahead. Today, I want to highlight both types: The Fed-proof, and the Fed-frightened. 2018 isn’t shaping up to be a bad year for dividend growth, but it’s not a particularly good one. At a roughly 7% payout-growth clip, we’re sitting at about the midway point of the past few decades, but a very slow pace compared to the past five or six years. Dragging that down are a number of larger companies whose dividend growth has essentially slowed to a halt. But they’re starting to get what’s coming to them. Every time the Federal Reserve ups the ante on interest rates, bond yields become even more attractive, and investors start to realize that they don’t need to rely on pedestrian blue chips if they want to settle for 3% yields. At the same time, some pockets of the market – most notably, financial stocks – are licking their chops over the hawkish Fed. That’s because higher interest rates not only signal a strong economy that’s supportive of their businesses, but rising rates themselves actually bolster their results. Right now, the market is separating itself into very clear winners and losers as a result of the Fed’s action. I want to show you both – a few popular blue chips that you might own right this very second (but shouldn’t! ), as well as a couple financials that pack a bigger income punch than you’d expect. I’ve previously lamented the glacially slow growth of General Mills’ (GIS) dividend. While the maker of Cheerios cereal, Yoplait yogurts and Green Giant frozen produce has strung together 14 consecutive years of dividend increases, it has been doing so in increasingly miserly fashion. In fact, its last payout hike, in July 2017, was by less than 3%. That already felt problematic when considering General Mills’ sliding top line and flat earnings. But recent results make GIS’ lackluster check-writing skills feel downright unacceptable. General Mills recently suffered its worst single-day loss in nearly a decade, dropping just shy of 9% after it warned investors that its full-year profits would come in between $3.08 and $3.11 per share – well below expectations. That’s because rising ingredient prices and “an unprecedented rise in logistics costs” are gobbling up profits, according to CEO Jeff Harmening. As a result, GIS is pulling a page out of the old “struggling-with-growth” playbook, announcing it would cut wherever it could to improve its margins and gussy up the bottom line to please investors. I’ll say this: At a 4%-plus yield and a forward P/E of 13.5, GIS certainly looks cheap. But as the Walmart (WMT) discount-movie bin often illustrates, sometimes cheap things are cheap for a reason. JPMorgan (JPM) isn’t exactly the first stock that comes to mind when you think of dividend growth, but guess what? 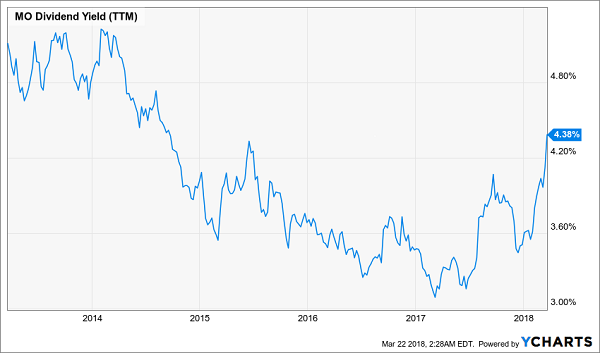 The House that Dimon Built has really been giving income investors their money’s worth in recent years, even if JPM’s current yield is nothing to scream at. Over the past half-decade, America’s biggest bank by assets has improved its dividend at a more-than-13% annual clip. That includes another generous hike of 12% announced in mid-2017. By the way, the reason JPMorgan delivers a mere sub-2% yield is because the stock just keeps growing like a weed. The stock has nearly doubled the market over the past five years, growing 142% to the S&P 500’s 75%. You can thank a number of factors for that. There’s the bank’s own operational quality, but also the continued expansion of the U.S. economy. Not to mention, JPM just keeps catching about every break it could want. JPM will benefit from a much lower corporate tax rate in the years ahead and continued financial deregulation in Washington, not to mention the fact that it and most other banks should actually benefit from higher interest rates in the form of greater net interest margins. In a way, a play on JPMorgan isn’t like beating the Fed – it’s joining it. When you think of dividend-paying consumer staples plays, you think of longtime income icons such as Procter & Gamble (PG) and Coca-Cola (KO). 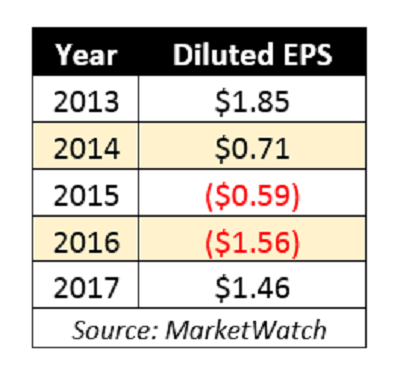 Sure, they’re not exactly the pinnacle of growth, but you can at least count on the dividend growing at least a little bit each and every year. ConAgra (CAG) is a staple of a different color. The ConAgra name probably isn’t terribly familiar, but its host of foods brands certainly are: Hunt’s vegetables, Orville Redenbacher’s popcorn, Reddi-Wip whipped cream and Pam cooking sprays – not to mention it also produces frozen foods under the Healthy Choice and P.F. Chang’s labels. And yet, despite having that seemingly robust stable of brands, ConAgra simply can’t get its act together. That has filtered down to one of the more unstable dividends among large-cap consumer staples. Consider that ConAgra has cut its dividend not once but twice since 2000 – in 2006 and then again in 2016, with the more recent cut a 20% hack to 20 cents per share. This after years of keeping it level at 25 cents annually. A no-growth company with slow dividend expansion is ugly enough – but a shrinking dividend? That just gives consumer staples a bad name. I want to travel across the pond to this next pick. Because while banking stocks in the U.S. certainly have a green light, they’re not the only financials looking good right now. HSBC (HSBC) is a global financial-services powerhouse based in London that boasts 38 million customers worldwide. The company offers just about every kind of banking there is – private, consumer, global, wealth management – and at roughly $200 billion at market capitalization, it typically floats within the top 25 to 35 largest companies traded on U.S. exchanges. HSBC recently reported a mostly so-so fourth quarter and full year that were slightly less than what Wall Street anticipated. The company was weighed down by a $1.3 billion writedown related to the collapses of Carillon PLC and Steinhoff International. From that angle, HSBC might not look so good. But longer-term, the company is pulling off a turnaround from years of ugly results to real, actual growth once more. Its loans business should help improve net interest income, as should rate hikes in the U.S., where each quarter-point increase should result in $330 million in extra NIM annually. That, combined with the possibility of a stock buyback announcement later this year, bodes well for continued growth going forward. Moreover, the company is paying out only about 75% of its profits toward its 5%-plus dividend, so the payout appears perfectly safe. Tobacco stocks have long defied the critics by rising against the backdrop of a wildly bearish narrative. Smoking numbers are in perpetual decline here in the U.S., with just about every level of government imposing ever-stricter rules on where people can enjoy these addictive products, and slapping ever-growing taxes on them. Altria (MO), for a long time, was no different. The maker of Marlboro cigarettes, Black & Mild cigars and Copenhagen and Skoal smokeless products was in fact much better than the market for several years. Despite being a dividend dynamo, MO shares also outstripped the market by about 160% to 90% for the five-year period up until Altria’s mid-2017 peak. However, reality is starting to catch up to Altria, whose shares have been careening lower for most of 2018. Part of that has been the increasing allure of bonds versus a company whose yield had for years not kept up with tobacco stocks’ generous reputation. But part of that is operational difficulty, with the company delivering a fourth-quarter revenue decline last month, and analysts expecting just 1% or 2% top-line growth over the next couple of years. Yes, Altria is figuring out how to squeeze ever more profits out of a shrinking user base, but you can only squeeze so hard. Altria may at least be making a short-term value case at the moment, but are you willing to bet on it for the next 20 or 30 years? At some point, smokers will get snuffed out (sorry!) from high taxes and onerous laws, and those dividends will be smashed. That’s a one-way ticket to the retirement poorhouse. But even stocks that can keep treading water in perpetuity can ruin your retirement. Stocks that only yield 2% or 3% with next to no dividend growth will leave you anywhere between 50% and 60% short of traditional retirement goals! You might not even be able to keep up with inflation! 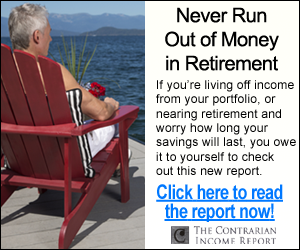 So, what do you need to reach the retirement finish line? It’s not easy. I’ve been buried for months trying to track down the kind of portfolio that offers the high current yield, dividend growth track and capital gains potential possible to reach double-digit returns … without betting the farm on yield traps whose payouts could collapse at any moment. But I’ve compiled a set of stock picks that will reap at least 12% in annual returns – which is what you need to ensure the kind of no-worries retirement you’ve been busting your hump to achieve for the past few decades. My “12% for Life” portfolio is not your garden-variety dividend portfolio. This portfolio is retirement catnip, because it provides the best aspects of numerous types of investment strategies – income, growth and even nest egg protection! 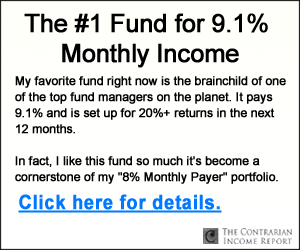 This basket of seven conservative investments includes under-the-radar stocks that can return 12% annually, which is enough to double your portfolio in six years. It also is built to be more durable against market downturns like 2008-09, which ruined retirement for countless Americans.